Malicious fake antivirus pages are pretty much all the same, with very straightforward code, which makes them relatively easy to detect. Most of these pages are also found just a few domains (mostly on sub-domains of xorg.pl, although the predominance of this domain has decreased lately), which makes blacklisting possible (although not the best protection). 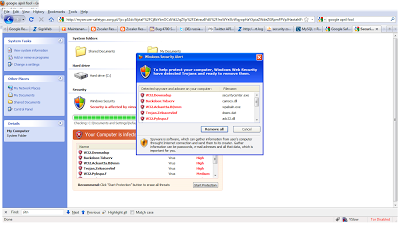 a simple HTML page which displays a warning about your PC being infected, and displays a splash screen. The page title is always the same, as well as the text displayed, while the page is loading. The main page is displayed only if you come from a hacked site, direct access to the page will provide a 404 'page not found' error. Your PC might be infected! In addition to the code obfuscation, the page title as well as the waiting text are a little bit different from the original fake AV page. The malicious payload is detected by only 6 AV vendors out of 41. Another sample that I discovered was detected by only 2 AV vendors!